Welcome to Just for Fun Fridays! 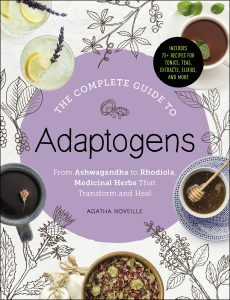 This is a new feature here on the blog where I share some of the interesting non-herbal things I’ve done recently. I admit – I’m one of THOSE dog moms. We celebrate the dog’s birthday AND give him people food (in moderation). So of course I had to make a pupcake recipe. Chaucer gets kibble at every meal but often gets a side of veggies, fruit, or other healthy tidbits, too. He’s not a picky eater, we stay very active so weight isn’t an issue, and I like to think he enjoys the variety. At least, he seems extra excited when I set down his food bowl and there’s something besides just kibble. He has good manners and waits until told he can go ahead and eat, but you can tell it’s harder than usual for him. So Chaucer recently turned two, and I had the (only a little) crazy idea that I wanted to find a tasty and reasonably healthy treat that we could all enjoy. The main things we needed in a pupcake recipe were gluten-free ingredients (for me) and not too much sugar. The last thing I need is my very hyper Catahoula pup all spazzed out on sugar – even if it IS his birthday. After exploring some recipes on Pinterest, I discovered a grain-free muffin recipe over at A Few Shortcuts that looked promising. Banana and peanut butter are two of Chaucer’s favorite treats, after all. There’s only ¼ cup of honey in the muffins, so they aren’t too sweet. So far, so good! They were so simple to make. We don’t have a hand mixer or a stand mixer because I rarely bake, so I combined all of the ingredients in a blender to get a smooth texture. I used one regular size, 6-muffin pan and a mini-muffin pan that made 24 Chaucer-sized cupcakes so he can enjoy them for a few days after his birthday, too. For the frosting, I made homemade whipped cream with a few teaspoons of maple syrup to sweeten it and ¼ tsp gelatin powder to stabilize the frosting. I love that they give it that cupcake “look” without being pure butter and sugar- much better for all of us. The peanut butter needs to be a plain, all natural brand for this recipe to be safe to share with your pup. 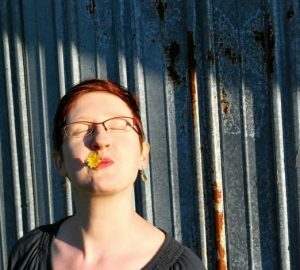 Be especially careful to stay away from sweeteners. Natural brands can sometimes contain sugar alcohols like xylitol to make the peanut butter taste sweeter without adding calories. However, your dog can’t process sugar alcohols the way you can. In fact, sugar alcohols like xylitol can lead to fatal hypoglycemia in dogs – so read those labels! We used a small amount of vanilla extract but you can omit the vanilla if you are uncomfortable giving your dog anything that contains alcohol. 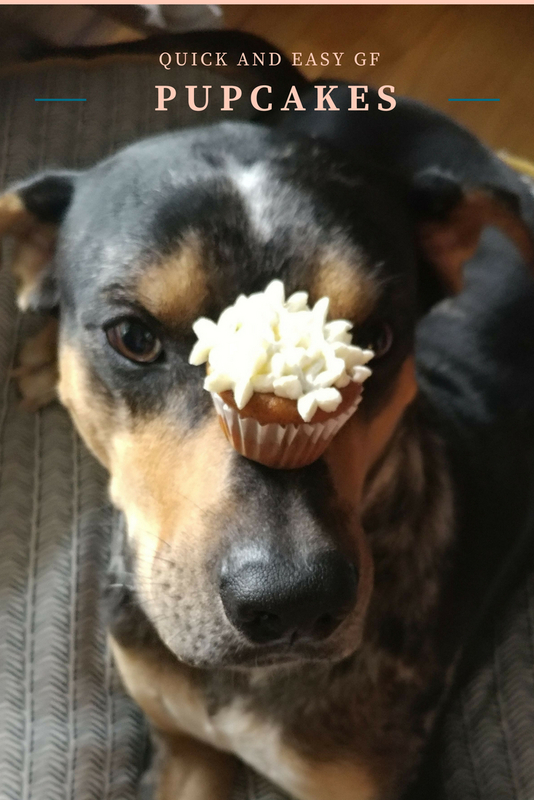 Read on below for the recipe and for some cute pics of Chaucer enjoying his pupcakes! 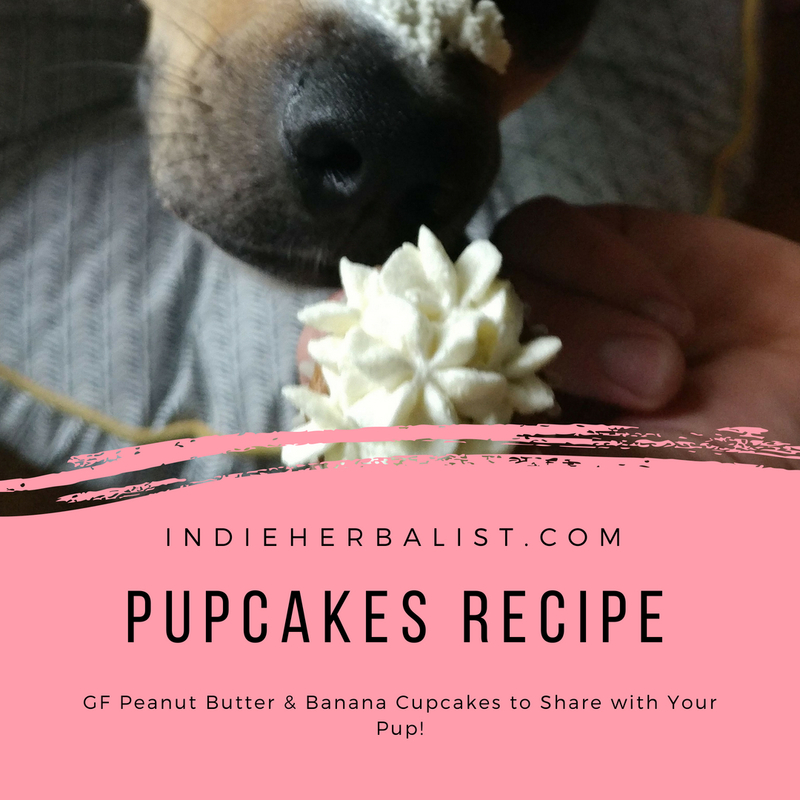 Be warned – these peanut butter and banana “pupcakes” are so good that your pup may not want to share with you – be sure to ask nicely! 1. Line a 6-muffin pan and a 24-mini-muffin pan with paper liners and set aside. 2. Preheat your oven to 350F while you prepare the pupcake mix. 3. In a blender, combine all of the ingredients and pulse until the pupcake batter is very smooth. 4. Use a teaspoon measuring spoon to fill the mini-muffin pan. Each pupcake will take about 2 teaspoons of batter. 5. Divide the remaining batter into the 6 muffin pan. 6. Bake at 350F for 15-20 minutes. The mini pupcakes took 15 minutes in my oven, and the regular size cupcakes took 20 minutes. If you take them out too early they will fall (oops!) so be sure that they look nice and dry on top. I don’t think you need to worry as much about over cooking these as you do with regular muffins or cupcakes. They are really moist! Make the whipped frosting while your pupcakes cool on a baking rack. 1. Chill a large mixing bowl in the freezer. My stainless steel one worked very well. 2. Pour the whipping cream into the chilled bowl and add the maple syrup. 3. Whisk in the powdered gelatin a little at a time to avoid lumps. 4. Briskly whisk the whipping cream until stiff peaks form. 5. Store in the refrigerator until ready to ice your pupcakes. 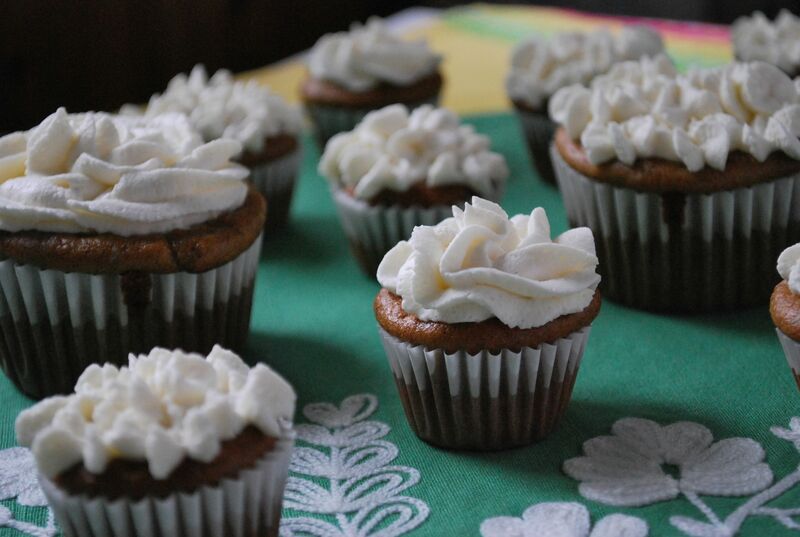 The gelatin helps the whipped cream hold its shape while you use a piping bag, and also keeps the whipped cream frosting from separating and soaking through your pupcakes. After you’ve made the whipped frosting and the pupcakes are cool to the touch, it’s time to frost your pupcakes. 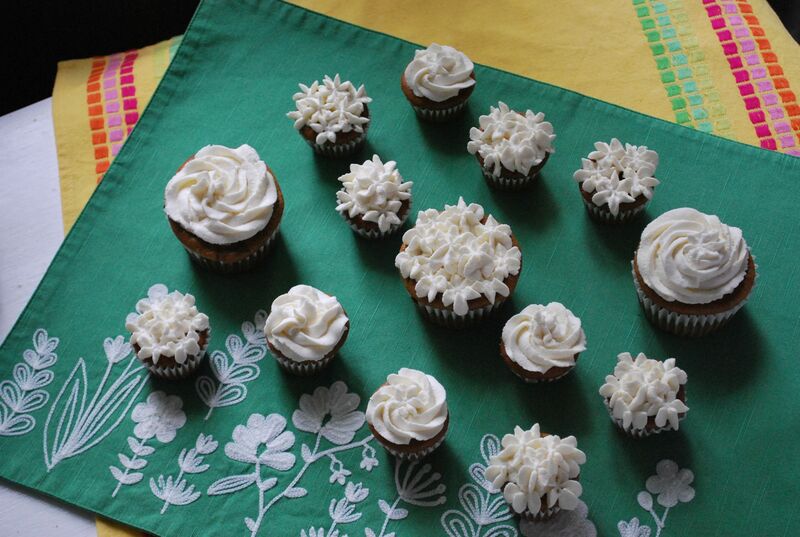 You can either spread the frosting on with a knife or fill up a piping bag and make them extra fancy. Because the frosting has gelatin to stabilize it, you can keep any leftover pupcakes in the refrigerator for up to three days – frosting and all! That is, if there are any leftovers.